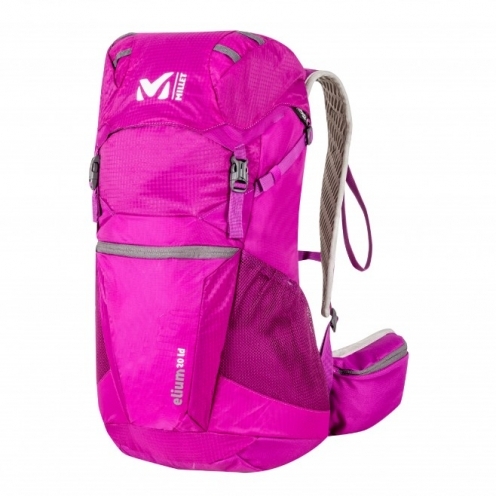 "The hiking backpack ELIUM 20 LD home MILLET is specially designed for hiking women. For those who love the hiking summer outdoor, walking fast, hiking dynamic and walking in the mountains. The container of 20 liters and its narrow profile makes it a backpack ideal for all your trips in the mountains one day. The ergonomic design of the ELIUM 20 LD convient to the morphology of women, including the silhouette of curvy women. Very comfortable thanks to its padded shoulder straps perforated you don't feel in your back. With a construction Airflow Suspended back which allows a better circulation of the air during intense activities. The frame external aluminium ensures a removal of the load of your body which increases the air circulation and will not have the back-soaked during your ride. - Weight : 0950 kg "